Find tweets up to 7 days old using keywords, #hashtags, @accounts, and other criteria. Advanced Search | What Do The Tweet Columns Mean? 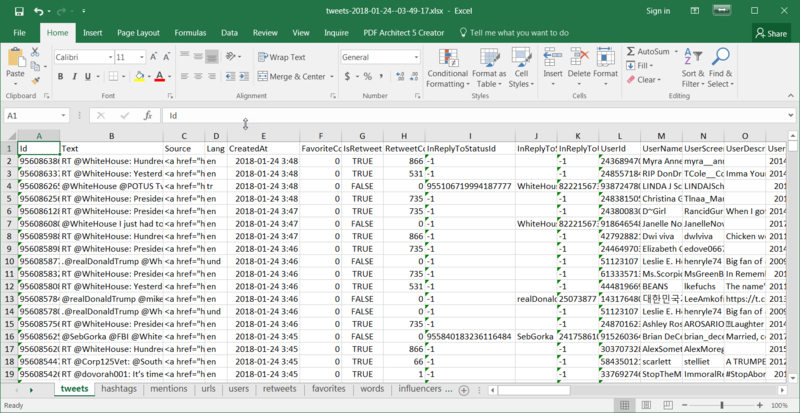 Save detailed tweet and account data to Excel. Each spreadsheet includes summary tabs for the top hashtags, mentions, URLs, users, locations, time zones, favorites, retweets, and keywords. Capture matching tweets immediately as they are published. Find Twitter accounts by their @ScreenName. Find Twitter accounts by who they follow. What Do The Followers Columns Mean? Find Twitter accounts by who follows them. What Do The Following Columns Mean?